Accelerated Mobile Pages (AMP) was announced by Google in Ocotober 2015. This is their plan to essentially strips blog posts and web articles of everything that would weigh it down and make it slow to load on a mobile device for the purpose of “improving the user experience”. To Google speed is everything, and the faster they can produce content for consumers, the more content can be consumed. However, after researching Accelerated Mobile Pages, and installing it on a couple of sites, I have a few concerns. AMP view will only happen when someone lands on your post as the result of clicking it from a list of search results. Direct mobile traffic to your URL will show the normal longer page load view unless they click on “reader view” in the mobile browser. Accelerated Mobile Pages works on blog posts, but not on pages. If you have the Yoast SEO plugin installed, you can install the Yoast plugin “Glue for SEO and AMP” that will allow you set options for pages if you wish. Google has stated that it will provide a cache that can be used by anyone at no cost, and all AMPs will be cached by Google’s cache. But the chances of them charging to do this down the road is real. There is also no real information yet stating how soon changes made to content will be reflected in the caching system, meaning their could be delays when information is updated or edited. Essentially if your content is not cached or formatted to be cached on Google's servers by having AMP on your site, you don't have a chance at ranking in mobile search results, because Google is positioning AMP results at the top of the page, followed by “mobile-friendly” results. WordPress has produced a plugin that will work with AMP to automatically format WordPress posts for AMP, but other platforms, such as Weebly, will have a harder time formatting their posts. There is limited analytics within AMP which should be visible through your Google Analytics account. You can also integrate third party analytics such as Chartbeat and Parse.ly. You will have to be more creative to monetize within the post content that will show up on the AMP simplified mobile version. There are some ad networks already working for specific AMP compatibility, and they are recommending no more than 1 add for every 250 words of text, but it needs to be inserted into the post itself. And as CopyBlogger states: “AMP doesn’t support forms, which means AMP pages won’t help you grow your email list.” At least not in the post itself. You will have to instead include hyperlinks that take them to a page (not a post) where the form is located. So do the concerns outweigh the benefits? It's too soon to say. With this being so new, there are still a lot of things to be worked out and improved upon, obviously, but I do think it is the beginning of a process to normalize all web content. It is important, though to stay up to date on the development of this as it all unfolds. 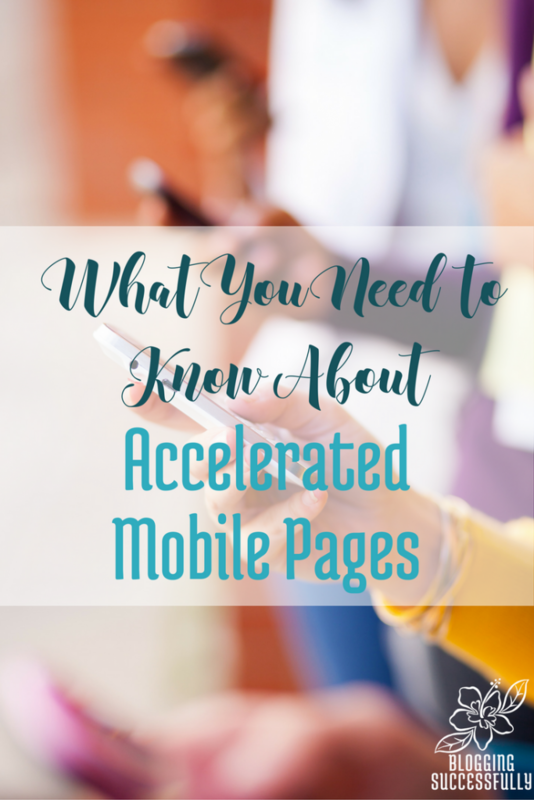 And Should I use Accelerated Mobile Pages? Yes, absolutely yes. More than half of all Google searches are done on mobile, so if you want to be found by mobile users then you must follow Google's preferred way of delivering that content (see #5). I’ll be covering more specifics of getting AMP set up on your site in our weekly coaching sessions in the Como Blog Connection. Join us!